The Riverside Children's Theatre (RCT) is the leading children’s theatre in Riverside County, California. Since 1957, RCT has introduced thousands of children to the magical world of theatre through participation in drama instruction and performance opportunities. Riverside Children’s Theatre, a non-profit organization, is the leading children’s theater in Riverside County with an award-winning performing arts school and performance troupe. RCT has won awards from the Inland Theater League and the Press Enterprise. For 60 years, RCT has introduced thousands of children from Riverside and surrounding communities to the magical world of theater. Through participation in drama instruction and performance opportunities both on and off the stage, RCT is instilling a life-long love of the performing arts in the hearts of our youth. RCT is open for enrollment for all children in grades K through 8, with opportunities for students in grades 9 and up to participate in our Tech class where they will learn production, make-up, and stage crew skills. Saturday School is the mandatory activity of the RCT program. Classes meet most Saturdays (typically 17-18 class days from late August through March/April) from 8:50 a.m. to noon, at Chemawa Middle School in Riverside. 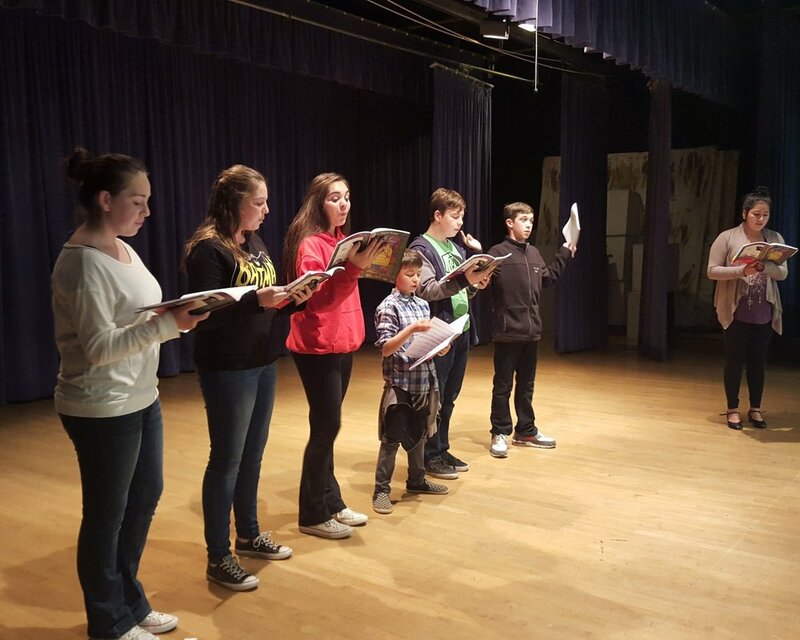 Students receive two hours of instruction in acting/drama, thirty minutes of dance, and thirty minutes of vocal music by experienced and qualified teachers every class day. Annual tuition for Saturday School is currently $400.00 for the first child, $375.00 for the second child, and $350.00 for each subsequent child. The Tech class is $275.00 per year. Tuition is due by the end of October for new families, and by the end of August for returning families. Click on the Membership link for information on how to place your child on our enrollment waiting list. RCT presents two musical productions each year, which are usually held in the fall and the spring. Participation in these productions is optional and is limited to students currently enrolled in RCT Saturday School. All children who choose to audition will receive a part in the production. The three hired directors for each production, who are not parents of current members, decide the roles based on auditions, grade level, ability, and various other factors. After casting, students may be required to rehearse as much as two hours every weeknight during the rehearsal period prior to opening night. Production family parents will also be assigned supervision duties throughout the rehearsal and performance period. Families whose children participate in a production will be required to sell thirty-two $12 tickets per production. There will also be an audition fee of $45 for the first child, $20 for the second child, and $10 for subsequent children. In addition, you will be responsible for the costs associated with making or purchasing your child’s costume(s). Families whose children are not involved in the production are required to sell four tickets per production. RCT is an all-volunteer organization that requires well-dedicated parents to run all aspects of the organization. RCT has many committees set up to aid in the running of Saturday School and our two annual productions. Some of these include set building, designing costumes, selling ads for our programs, operating the concession stand during Saturday School, and working in the make-up room or in the gift boutique during productions. Parents are required to sign up and work for 18 hours of committee work per year, per family.